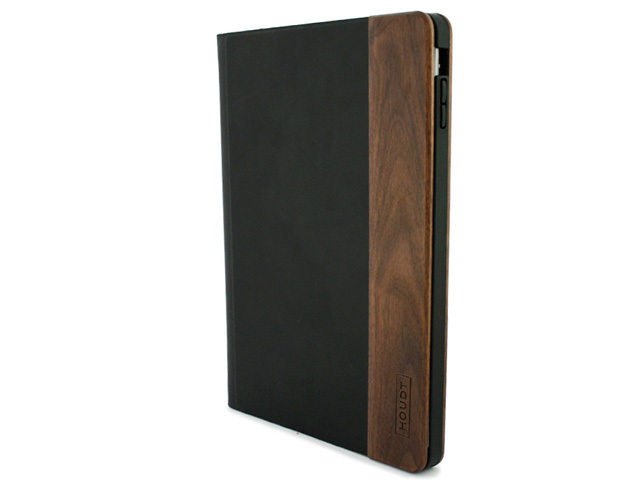 If you own an iPad, no doubt you are very aware of a particularly important accessory – the humble cover. Besides from just protecting the precious (read: expensive) device, this can and does do more than just the obvious, from adding a sense of style and individuality to greater functionality for typing or viewing videos on the tablet. What quickly becomes apparent though, is that many covers invariably need to be replaced due to wear and tear. One option that I recently went hands on with was a cover from Houdt, which distinguishes itself by using wood in its offerings. For the most part, the cover looks fairly standard – a black front and back piece, with the wood (a deep brown walnut, in the cover I reviewed) being incorporated into the right hand side. This lends it a natural and classy look; and was positively commented on by several people I showed it too, including I might add, some employees at an Apple iStore. It further looks and feels very well made; it certainly didn’t feel cheap either. As one of the iPad users who has gone through scores of covers over the years, I would reasonably expect the Houdt cover to last longer than some of the alternatives out there. Beyond that, I was glad to see the plastic base which supports the iPad offers solid protection for the sides, top and a good portion of the bottom of the device as well. While there is an open slot for the power button and the rear camera, the volume buttons have their own coverings, which one presses to turn volume up or down. Happily, these worked well, and didn’t prove unduly tough to the press. Another problem that we have found with some other iPad covers is that the interior of the cover can leave streak marks on the screen, especially when the flap is segmented. This though, wasn’t an issue with the Houdt cover; owing, I suspect, to the nice soft material lining the interior. Additionally, the sleekness of the cover added scant weight to the iPad, very important for those who tend to hold their devices for long periods of time. So far, so good. There is though one omission that I found to be a pity. The cover does not, unlike Knomo’s offerings or the smart cover from Apple, put the device to sleep and waken it automatically. That unfortunately, led to a few instances where my iPad drained its battery without my realising it. Additionally, the lack of some means of keeping the cover closed, meant that the cover flapped open at times, leading to the same problem. This is a pity; had this been included it would have just ticked all the boxes in what one looking for in a slim cover would hope for. Despite that, the cover is nonetheless very appealing, due to its unique and classy appearance, its solid construction, its thin profile and its light weight. Finally, it’s not too bad pricewise, considering many covers top the R1 000 mark, coming in at R800. You can visit their website to order, or alternatively, the cover is available at iFix stores.